Local communities in Bhutan possess a vast amount of traditional knowledge, including how to grow, harvest, and use over 200 types of medicinal plants. In the Himalayan Kingdom of Bhutan, the country’s rich biodiversity includes some 200 species of medicinal plants. The intricate linkages between Bhutan’s rich culture and natural heritage has created a vibrant tradition of sustainably using local ecosystems’ genetic resources and preserving the vast stores of traditional knowledge held by local communities. Recognising the importance of this knowledge and value in bolstering these symbioses, the Implementing the Nagoya Protocol on Access to Genetic Resources and Benefit Sharing in Bhutan project is supported by UNDP Bhutan, the Nagoya Protocol Implementation Fund, the Global Environment Facility (GEF), and is being implemented in partnership with the National Biodiversity Centre (NBC), Menjong Sorig Pharmaceuticals and Bio Bhutan. The Nagoya Protocol Implementation Fund (NPIF) was established to promote access to genetic resources and ensure that there is a fair and equitable sharing of benefits arising from using them. The NPIF’s Access and Benefit Sharing (ABS) project creates incentives to conserve and sustainably use genetic resources – preserving biodiversity and simultaneously enhancing development and human well-being. The ABS project is supporting collaborations among the Government agencies, a private entity and local communities. Benefits are beginning to manifest in the form of business, employment, research, technology transfer, and capacity development opportunities. Working in three villages (Namthar, Dagala, and Lingzhi) the initiation of three pilot ABS partnerships is working to support indigenous villages preserve their ecosystems’ genetic resources - and the traditional knowledge based upon them. Through an established ABS framework that ensures benefits are ploughed backed into communities, the project promotes people-centric conservation by incentivising the communities to conserve and sustainably use their natural resources. Training provided by the project also ensures that local communities are able to participate proactively in conservation activities, thereby ensuring sustainable use of Bhutan’s rich biological and genetic resources. To date, project activities have achieved widespread awareness of ABS with over 11,042 participants (with almost equal participation by men and women). These participants include farmers in 133 gewogs [geographic administrative unit] and over 200 officers/researchers in regional and national organisations, parliamentarians, academicians, and business people. Beginning in June 2015, the communities of Namther in central Bhutan were the first participants in the ABS projects’ partnerships. Collaborating with Menjong Sorig Pharmaceuticals (MSP), the intention was to further strengthen the long-standing tradition of harvesting low-altitude medicinal plants and develop products that can be developed further for sale in domestic and international markets. The farmers of these communities possess traditional knowledge about medical plants and have been capitalising on this knowledge through their work with the National Health Care System over the last 50 years. Most importantly, these farmers’ groups - comprised mostly of women - know the importance of biodiversity conservation and strictly follow a sustainable method of annually harvesting the medicinal plants. 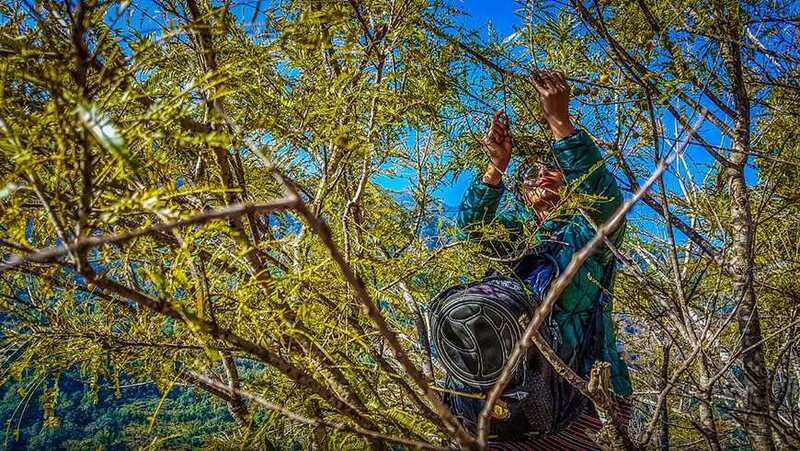 In recent years, having recognised the potential health benefits of Bhutan’s unique endemic plants, MSP has been developing noteworthy prototype products in its laboratories in the capital, Thimphu. "This will mark the real beginning for research and development of products as well as enhance the vast traditional knowledge on genetic resources," said Sherab Tenzin, the Head of MSP, the Pharmaceutical and Research Unit under the Department of Traditional Medicine Services in the Ministry of Health. The success of such projects stands to benefit the local farmers through higher incomes as well as conservation. Dagala is a high altitude region in western Bhutan inhabited by a semi-nomadic community of yak herders who – aside from their yaks - have limited income generating opportunities. Rhododendrons are already widely grown in close proximity to the yak herders’ lands, and has traditionally been harvested and sold to local incense sticks makers – albeit in low quantities and at marginal prices. The ABS partnership pilot in the Dagala region brings together the community of yak herders and Bio-Bhutan, a local private company well known for its work with essential oils. Under the partnership, Bio-Bhutan is working with communities to develop natural products from Rhododendron species. Now the harvests are poised to reach more lucrative markets through the partnership. In its Thimphu laboratories, Bio-Bhutan has been equipped with a high-end steam distillation unit provided by UNDP Bhutan. The distillation machinery is still in its initial production phase, but has successfully produced several batches of high quality essential oils from the Dalaga region’s rhododendrons. The oil has been used in the production of prototype products such as bio-soaps. Bio-Bhutan is committed to linking local cooperatives, community forest management, and women‘s groups to national and international markets with quality, natural, organic products, while making use of locally available resources and promoting livelihoods. UNDP Bhutan’s partnership with local communities, National Biodiversity Centre and MSP, and the Dagala region’s partnership with Bio-Bhutan through the Access and Benefit Sharing Project, will advance Bhutan efforts on SDG 1 on poverty, SDG 3 on good health and well-being, SDG 12 on responsible consumption and production, SDG 13 on climate action and SDG 15 on life on land. UNDP is committed to building the capacities of developing countries to manage their biodiversity, and is currently supporting the sustainable management and conservation of over 320 ecosystems. With projects in over 130 countries, UNDP is working to support countries to conserve and sustainably use biodiversity, in line with their own priorities and needs, and to secure ecosystem services that are vital to human welfare and their development efforts. For more information on the ABS project in Bhutan, please visit here.